Keep in mind that Corporate 3 Design has the graphic design expertise to tackle your next display project. We can assist you with all of the details for your next trade show, including selecting the right hardware along with handling all the production to ensure the final product looks great. 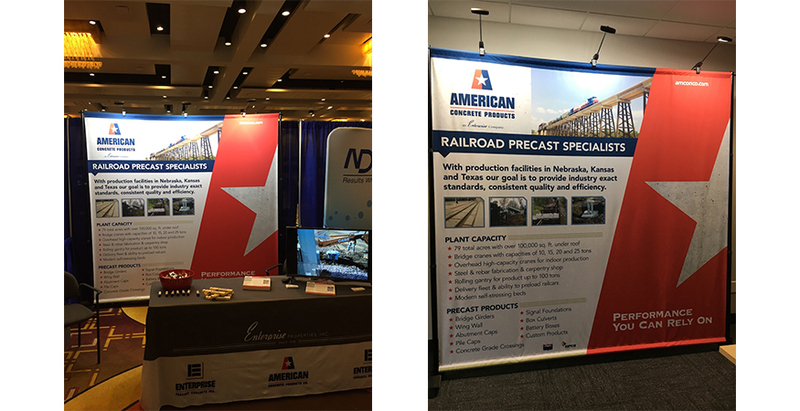 Our most recent display project was for American Concrete Product’s railroad division in Dallas, Texas. This included a full-size 8’x8’ display for large shows and tabletop 8’x4’ display for local shows. This banner stand is collapsible for either size, and the graphic panel is cloth for easy set-up and tear down when marketing at events and trade shows. Long time client, American Concrete Products of Valley, NE and Kansas City, Kansas recently assumed the identity of it’s sister company, Enterprise Concrete Products. We are currently producing a similar display for their pipe and utility divisions in Nebraska and Kansas. Along with the displays, sales sheets were created and a new website will soon be launched, all complementing the company’s brand that was created at Corporate 3 Design. Call 402.398.3333 for the most immediate response or email C3D Account Executive Jeff Walker for guidance in planning and designing your next display project.